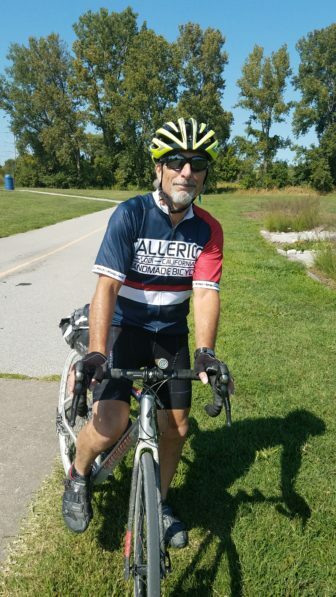 Dr. William Madosky, area chiropractor and avid biker, is planning a two-day, 186-mile solo ride on the KATY Trail to raise money for a Maplewood non-profit. Madosky is planning the ride for Labor Day weekend — Sedalia to Jefferson City on Friday and Jefferson City to Creve Coeur Lake on Saturday. Last year he rode 100 miles in one day, raising about $4,000 for Artists First, in Maplewood. This year a donor has agreed to match everything raised up to $5,000, so Madosky hopes to make it a total of $10,000 for the charity — giving himself the extra challenge of a two-day, 186-mile ride. He said he’s already raised $1,400. According to its website, Artists First is: “a nonprofit organization that provides aspiring artists of all abilities access to quality materials, expansive studio space, respectful guidance, and a friendly, supportive community. At Artists First, individuals are offered a platform to grow through creative self-expression socially, intellectually and emotionally.